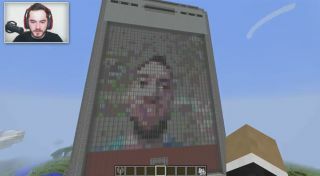 Have you ever said to yourself, "Boy, I wish I had a mobile phone in Minecraft that let me browse the web and make video calls to the real world?" I'm guessing probably not, but it's actually now possible to do just that through a web app called Boxel. Developed by Verizon, it uses server-client architecture to translate web pages and streaming video into blocks that can be built into the game automatically and in real time. The in-game "phone" supports video calling as well as texting and MMS, and even comes with a selfie stick. That's actually a useful tool to have on hand, because the people on the other end of the video call—in the so-called "real world"—will see your Minecraft avatar, represented just as he or she is in the game. The images and video feed are very blocky, as is the way with all things Minecraft, but as YouTuber CaptainSparklez—he of the super-sweet house—demonstrates, it actually works quite well. This clearly isn't the most efficient way to make a date or order a pizza, but on a scale of one to ten, this is damn cool. A more detailed explanation of how it all works can be found on the Verizoncraft Github page, which also contains links to the libraries, all open source, so if you've got the skills and inclination you can give it a go yourself.